Today Rob Shandley took Aurora 101 through the speed trials. We clocked a speed of 94.74 km/h, the fastest Australian qualifier. This is the same speed as we made in 1996, but this time the track was 100 m shorter, so our acceleration performance is a considerable improvement over that last time. We have had another good day. Today Mark Gilligan has re-built the battery box to fit in extra cells, and the new arrangement has passed scrutineering. We have also done another 200 km of road testing, and practice runs at the Hidden Valley track for tomorrow's speed trials. 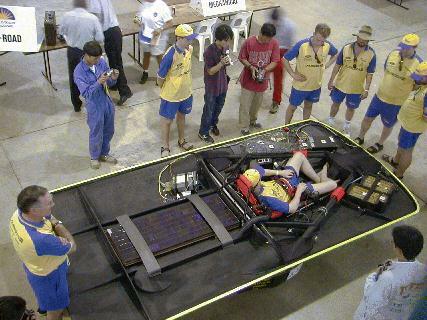 This gave us a chance to see the Minnesota team (see picture - their car is called, believe it or not, Aurora 4) and the team from Central Queensland Uni., who are racing one of our old cars--the one raced last time by Lake Tuggeranong College. It has been raining heavily all morning here in Darwin. Currently we are still in scrutineering, with only the batteries left to be checked out. Once that it is finished, we hope that the weather will have cleared up enough for us to do some practice for the speed trials later this afternoon.